CD&M combine 50 in front of the depot at Glenmary Park. The lake can be seen through the depot. The camera is looking north. Photo by the Bierberg brothers from the Galen Gonser Collection. 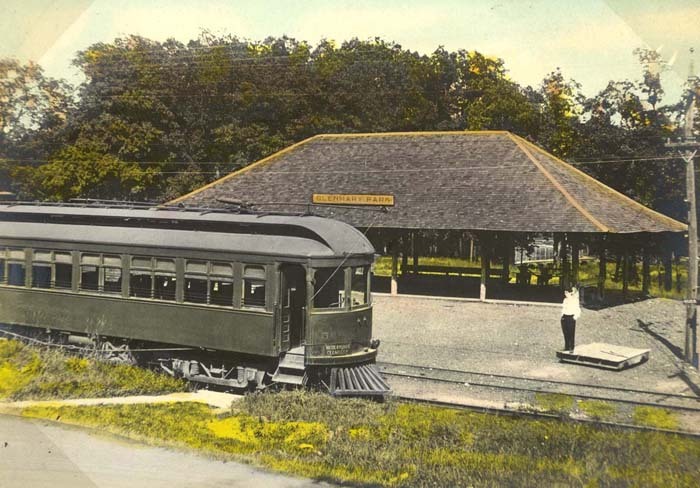 Parks were important to interurban lines for they generated riders, especially the CD&M's Glenmary Park located on the north side of Glenmary trestle near Worthington. There were two types of parks in the early days of interurban travel. Amusement parks had rides, games and theaters. 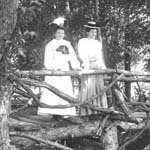 Undeveloped parks typically had a nature theme, perhaps a small lake, nature walks, facilities for picnics and a shelter house. All of the CD&M’s parks were undeveloped but never the less popular. To appreciate the pull of taking the interurban to a park consider that there was no air conditioning, usually the city had dirty air from all that coal smoke emitted by industry and railroad steam locomotives, and the water was not always very pure. One interurban, the Scioto Valley Traction, even had a nice business bringing bottled spring water to Columbus. A trip to the country side on a hot summer day would have been a treat. When the CD&M was first built the city dweller could chose from Stratford Park, Greenwood Lake Park or Marion Park. Soon a new park – Glenmary Park – was built closer to Columbus that would be the interurban's big draw. Stratford Park was located between Stratford and Delaware along the Olentangy River. There were plans to build a 198 X 250 foot pavilion where dances could be held. It is not clear if a pavilion was actually built that large. Stratford seems to have been eclipsed by Glenmary Park. Greenwood Lake Park was developed by the Delaware Street Railway. It was located on 50 acres on the northeast side of downtown Delaware. It had a nice lake, a little larger than the lake that would be created at Glenmary Park. Marion Park was an early CD&M park located nine miles south of Marion. It is not clear if this is the same spot as the new Greenspur Park which will become the northern terminus of the CD&M rail-trail now being developed on the old CD&M right-of-way. The crown jewel was the 54 acre Glenmary Park with its small lake, nature trails and picnic facilities. There was also a pavilion used for dances and other events. A ravine cut through the property, crossed SR 23 and continued to the Olentangy River. The creek in the ravine was dammed up providing the lake. Glenmary Park was on the east side of SR 23. Across from the Park was Camp Mary Orton. The 167 acres making up Camp Mary Orton was purchased by the Godman Guild as a camp for disadvantaged children. In 1910 the Godman Guild operated a settlement house in Fly Town, a poor community in the near north side of Columbus around Goodale Park. It’s easy to assume that Camp Mary Orton was at one time Glenmary Park, but not so, they were across the road from each other.